It's fair to say come the end of the week (or Wednesday - let's be real) there's nothing better than a cold glass of wine to ease the memory of a tough day - or if there is, I'm still yet to find it. But often those times when you really need it, y'know like on a Thursday night during the commute home, or a family gathering where your creepy uncle is telling you his life story, it can be kinda socially unacceptable to carry a bottle in your bag. Well not anymore my fellow wine fans! Now, thanks to Drinksbag Company, you need never be without a glass of the good stuff, 'cos they're selling a collection of genius 'wine handbags' that allow you to take the party wherever you go. Forget floral crowns and glitter tattoos, this is our newest festival essential! Priced at £49.99, the DrinksBag has an insulated lining and a secret opening for any boxed wine bag or cocktail pouch with a nozzle dispenser, keeping your vino cool while discreetly concealing it, allowing you to pour on the go. The company, aka the brains behind the boozy bag, say of their creation: 'We wanted a cool bag to look smart, stylish, but still practical to fit everything in, that didn’t use any bottles or bottle tops. As you can’t take in bottles or bottle tops into venues, this means we are stuck with the venues wine and prices. Also unattractive coolbags or rucksacks to carry our wine.' We're sold! There's also room for glasses and a full width zipped pocket to hold your personal belongings, like purse, phone, straighteners, dressing gown - those things you can't go without, making this possibly the only bag you need to take out with you. Although we wouldn't recommend sticking your laptop in there amongst the wine for obvious reasons, so maybe it's not the only bag you'll need. ​So all that's left to ask is: red, white or pink? 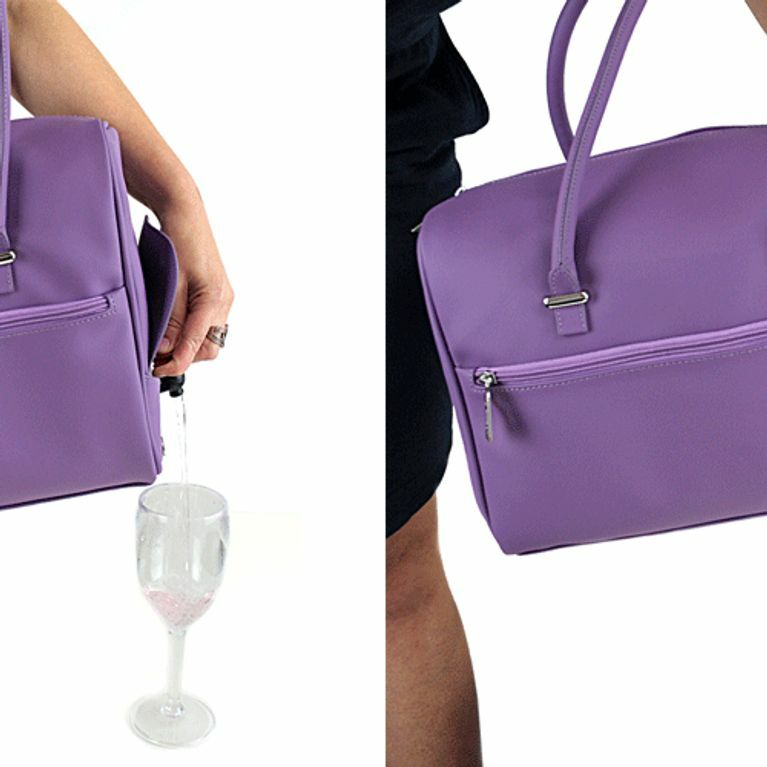 Do you think the wine handbag is what we've all been crying out for? Let us know what you think of this handy handbag @SoFeminineUK!